It was the year 1985. I was in Kindergarten. 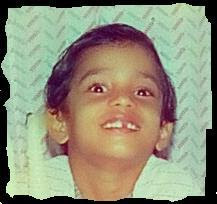 Many would know that I was in love with a girl called Renu in my kindergarten days. Renu was in love with Shabir and hence mine was a triangle love story. The initial few days in Kindergarten were the toughest days of my life. I found it difficult to hold the small chalk piece and write all the letters in the English alphabet in a small slate; at the same time I found it difficult to cope up with the emotional pressures that became more and more because of Shabir's presence in the class. How much can a three year old boy handle? Shabir was the only guy in class who can chew the chewing gum without swallowing it. So he was the Hero of the class. He had also stopped bed wetting. I was a regular bed wetter during that time. I continued to wet my bed for many more years. Now this post is not about my bed wetting heroics. So let us get back to the topic. As Romance for Renu bloomed in my small heart, I was not the same anymore. I would sit in the front bench in the classroom. She would sit in the adjacent bench. I would often give her a romantic look at her. She would sit in her bench like an angel and would throw an "I don't give a damn" look at me. At the same time, she would blush when Shabir looked at her. This would make me feel so bad. I would feel like punching Shabir on his face. But I wasn't strong too. The agony in my little heart became increased and it was hard for me to bear. There have been times when I would break into little shudders while sitting in the potty. No one would see my tears. One day, I gave my regular romantic look to Renu and she reciprocated with a smile. It was the happiest moment of my kindergarten days. Shabir was absent that day. I decided to make full use of the opportunity to win Renu's Love. During the recess break, I went near her and offered her two milk bikis biscuits. She picked them from my hands and smiled at me. Was she smiling at me because Shabir was absent that day? Did Shabir threaten her that he would kill her father if she smiled at me? and Was that the reason for her not smiling at me all these days? I also learnt that Shabir was on leave because he was down with viral fever and that meant that he would be on leave for a week. I was happy , because i knew that this was the best opportunity for me to win Renu's love. That was the moment Red became my favorite color too. The next day, I wore a red shirt and a red short trousers to school. Renu was in a red frock with red laces . She was beautiful. I wanted to dedicate the song lady in red for her. But I did not know the lyrics by heart. So I just hummed the tune. She smiled at me. During the recess time, I approached her and said to her, " Can We build a sand castle during our play-period. She said Yes. The next two hours seemed like eternity. I waited for noon to come. Every afternoon, the kindergarten kids were allowed to play in a small room. We called it the sand box. We would have small plastic mugs and water bottles. We were given an opportunity to build clay castles. I never liked playing in the sand. I always picked the sand and sprinkled them on all the girls in the class. But today, I decided to behave like a good boy. Renu agreed to play with me, in spite of knowing that I was a brat. During lunch time, I could not eat the rice and sambhar. It seemed that I was already full. I closed the lunch box and washed my hands. I was now ready to play the sand box game with Renu. The bell rang. I ran to the sand box room. Renu was already sitting inside the room. She looked like an angel. She did not have wings though. I slowly walked and sat next to her. Shalini and Radhika were also sitting along with Renu. I did not want them around. So I tried to make them understand through my facial gestures. Shalini thought that I was indulging in eve teasing. She took a fistful of sand and threw it on my face. If Renu had not been there, Shalini would have been dead meat by then. So I acted like a gentleman, I took an handkerchief and wiped my face and said, " That's ok Shalini. I forgive you". Renu smiled at me. I knew that I had created a good impression on Renu. Immediately Radhika, who was sitting behind me emptied a handful of sand inside my shirt. Before I could react, Shalini attacked me from the other direction. I remained calm as a cucumber. When Shalini tried to attack me again, Renu stopped her. That was the happiest moment of that day. Renu came near me and wiped my face with her soft hands. Then she said, "Chriz, I wanna tell something to you. Can you please close your eyes". The very next second, I closed my eyes. Then she told, " Chriz, Can you please open your mouth?". My mouth opened automatically. Soon she filled my mouth with some sand. I realized that Renu also had played a prank on me. I controlled my tears and slowly walked out of the sand box room. As soon as I stepped out of the room, it started raining. I slowly walked into the rain so that no one could see my tears. Till date, I don't know why Renu did that to me; and I am not gonna crack my head in trying to figure the answer. Next Post : The Love letter that made Renu fall for me. Chriz... Its so nice.."During the recess break, I went near her and offered her two milk bikis biscuits"
These lines shows the innocence of puppy love..
U r Rocking.. Waiting for ur next post..
omg! At 3yrs you were in love. heheh.